With the highly anticipated rematch just over 24 hours away, tickets are coming at a premium in what will surely be a sold out fight. Face value of tickets range from $50 to $600. Tickets through SeatGeek have an average purchase price of $156.67. The majority of boxing fans just want to be a part of this historic rematch and do not seek paying a premium for closer seats. While this may not have the magic of the highly anticipated Pacquiao vs. Mayweather fight, tickets are not cheap. Looking at the face value of tickets in comparison to listing is quite interesting. Floor seats have a 25.03% markup while the 200 and 400 Levels have an increase of 27.56% and 28.32% over face value, respectively. 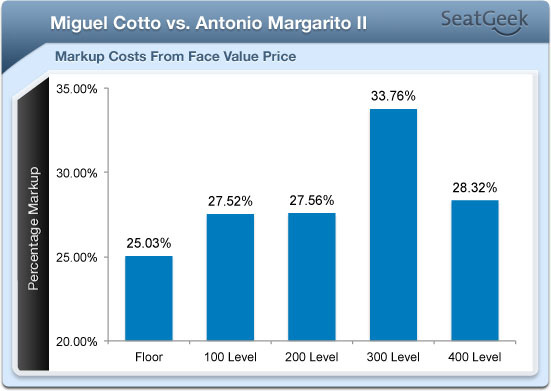 The highest increase is in the 300 level, a 33.76% increase, and an average purchase price of $150.98. It may be a historic night, but you’d be hard press to find fans willing to shell out over $800 for tickets. Last I checked, the economy isn’t so hot. Bob Arum and Top Rank – help us out here? 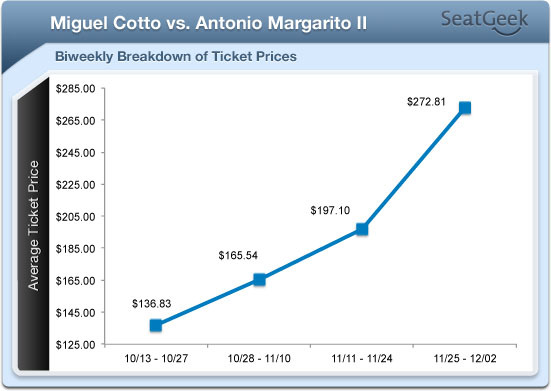 Tickets purchased after Thanksgiving have gone up tremendously with an average price of $272.81. No doubt the increased media attention and HBO’s 24/7 documentary have driven the price of the rematch upwards. Many boxing fans have already purchased their cheaper seats and secured a seat for possibly the fight of the year. Of the remaining listings, over 81% of tickets are for either 100 Level or Floor seats. However, use SeatGeek’s Deal Score™ to help you get some premium tickets for what will be a historic bout.